This walk offers the gentlest of introductions to the area (map), the relatively short ascent allowing time to explore the summit plateau en route. Park at the top of the col du Coq (1434 m grid ref. UTM 31T 72238 50205), and follow a path through the woods towards the Dent de Crolles (it divides after a few metres - keep to the right). This take you onto the pastures beneath the impressive summit cliffs. These pastures are a riot of colour in the spring. Follow the track up to the col des Ayes (1538 m), reached some 20 minutes after leaving the car, and turn right following the zigzags up towards the cliffs. At a junction near the top of the pasture, take the path to the left, which traverses above some steep slopes. After a further ten minutes, you reach the Trou du Glaz, one of the entrances to the extensive Dent de Crolles cave system. A cold draught blows out of the interior, and ice will be found covering the floor quite late in the season. With a couple of lights, it is safe to venture through the entrance chambers for some 250 m until the draught emerges from a narrow, greasy ascending rift. Beyond are a sequence of shafts, so you should turn back here, although you can get a flavour of what the cave is like further in by looking at the dedicated photograph album. Continue from the Trou du Glaz, for a few metres until some cables can be seen ascending the cliffs on the right. Climb these easily, and follow the path up a few chimneys and across ledges, rising up the cliffs through a line of weakness. This part of the route is fun, but easy, and you gain height rapidly. After another ten minutes, another junction is encountered. The path to the right is the Sangle de la Barrère. This will also take you to the summit of the Dent de Crolles via an impressive ledge system traversing the southern cliffs. This is a fine route, quite straight forward, but is probably best left for the descent. Continuing straight on leads rapidly to the summit plateau. After being dominated by cliffs since leaving the car, it is good to reach the wide open views. After a few more metres, you will reach a cross-roads. This is an important junction, and it is useful to pause to take one's bearings. To the left, a five minute and highly recommended detour will take you to the Belvédère. This is a high point on the ridge, which as its name implies, is an excellent view point. From it, one can look right down the Perquelin valley, to St. Pierre de Chartreuse and the café where you will probably be refreshing yourselves within a few hours. The spring flora here is quite exceptional, with a thick covering of elder flower orchids being particularly outstanding. Straight on leads through the pavement and dwarf forest along the Tour de Chartreuse towards the col de Bellefont, and right leads towards the summit. The kilometre or so to the summit can either be taken along the path to the left of the shallow valley which is well cairned by the PNRC, or more interestingly, you can wander up the limestone pavement up the synclinal valley itself. On the way up, you may spot the P40 pothole, which is the original top entrance to the caves underneath. It's a 30 metre deep shaft, a little too wide to jump over, with a plaque fastened to the wall. Experienced cavers can descend this shaft, to emerge either at the Trou du Glaz, or the Grotte du Guiers Mort over 600 metres below, according to taste. On a clear day, the views from the summit (2062 m) are spectacular. The Belledonne hills can be seen over the haze-filled Isère valley to the east, and 100 kilometres to the north-east, the white mass of Mont Blanc seems to be hovering in the sky. To the north, west, and south, the Chartreuse massif fills the near and far horizons. Apart from the way up, there are three possible descents back to the col du Coq. The least direct, and one which explores more of the fine plateau area follows the north ridge from the summit. Beyond the Roche du Midi, a small path, not marked on the map, descends and swings to the east. It passes a small spring in an open stretch of grassland - an idyllic place for a camp, and after crossing an area of pavement, finishes at the cross-roads below the Belvédère. Follow the route back towards the Trou du Glaz. A way which is not particular recommended is to go directly back to the col des Ayes, via the Pas de l'Œille. This follows the fault gully which descends through the cliffs 100 metres north west of the summit. It is quite straight forward, apart from being steep, but it is a little loose in its upper reaches. Its descent does include a couple of steep rocky sections, but these are quite easy, and not exposed. The third descent is by means of the Sangle de la Barrère, which takes a spectacular line along a system of wide grassy ledges along the southern cliffs. Whilst from below, the route looks impossible, it is, in fact, very easy, with but one somewhat exposed section near the beginning. The route starts just below the top of the Pas de l'Œille gully, and leads off towards the right. Note that it starts somewhat tentatively, well above the prominent pinnacle in the centre of the gully. 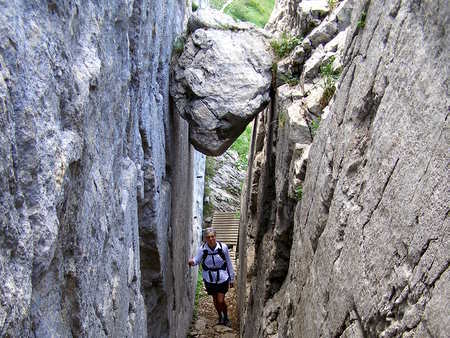 After a few metres, the path leads round a somewhat exposed nose, but thereafter, it follows a wide ledge system, which descends back to near the top of the path from the Trou du Glaz. In spring, the fine bear's ear primroses are commonly found, clinging to crevices in the cliffs. This route is highly recommended.